A concert/show, all the band members are live on stage and nothing is Pre-programed electronic disco or back tracks. What you see are master blues men, Blues Brothers Celebrity Look Alike, Lookalike Impersonator Tribute Artist at their craft, this is one of the tightest bands around and provide the main drive of the performance; the guitar, keyboard and sax playing are particularly impressive. Blues Brothers Celebrity Look Alike, Lookalike Impersonator Tribute Artist. The will sing all the classic Blues Brothers songs and rock the house. Their show is highly energized. The Blues Brothers Celebrity Impersonator Tribute Show is one of the most requested shows in the nation. 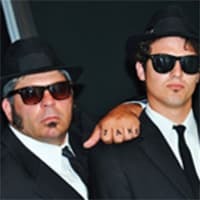 Their show will get all your guests on their feet dancing and singing along to all of their classic hits as the Blues Brothers look alike impersonator in their show. Jake and Elwood will make your event a lasting and wonderful memory for you and all of your guests. We are ready to travel all across the country and the world. Can be booked as a track show or with a full band and backup dancers.